A while back, I wrote a review of a book entitled “A Friend in Grief, Simple Ways to Help” by Ginny Callaway. The author recently ran across what I had written and thanked me for the review. I, in turn, discovered she has a website where this wonderful book can be purchased. Please visit her site at: http://www.afriendingrief.com/. In a gift shop, alongside books about local lore and tourist information, I recently found a book on grief written by an author who practically lives right in my own backyard, so to speak. 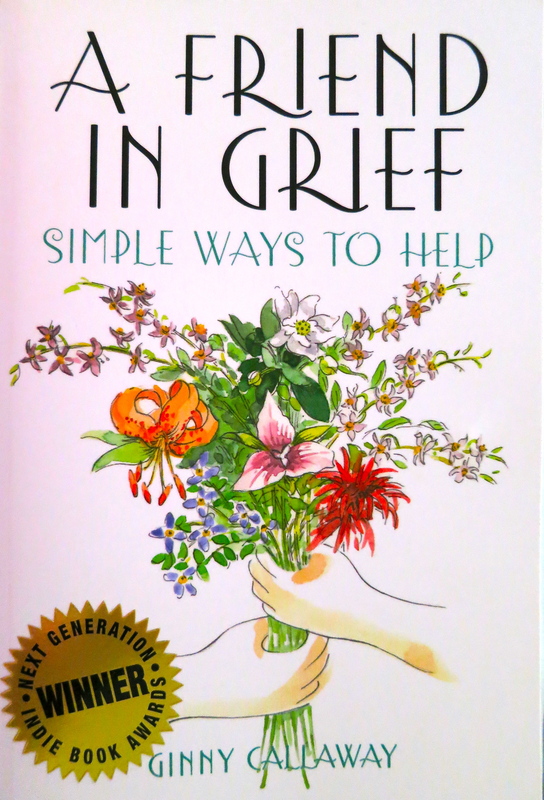 The book is entitled “A Friend in Grief, Simple Ways to Help” by Ginny Callaway and is a Next Generation Indie Book Award winner. Since I always keep an eye out for helpful books on grieving to read and recommend, I picked it up. A Friend in Grief is a small book which I found to be very well-written and very readable. Each chapter is brief, to the point, and contains specific helpful suggestions. The Content page is also helpful in that it lists each chapter title and briefly states what the reader will find in each chapter. 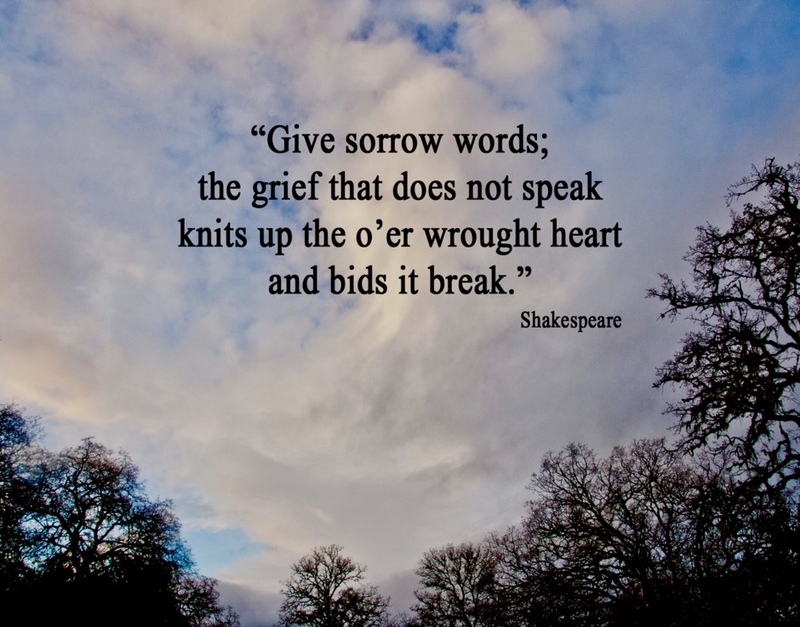 Just a side note…I’ve pondered this difficult situation many times – that of stepping forward into grief or stepping away when someone we know has lost a dearly loved one – and I’ve sort of settled on the following theory. When someone we know has lost a loved one, we do what we know to do immediately following the death. We send flowers or a a gift or a card. We go to the funeral or memorial service. We tell the bereaved how sorry we are and that we are praying for them or thinking of them. We sign up to make a meal for the bereaved. After that, there are crucial times that set the path for our continued relationship with the griever. The first crucial time is not long after the first few weeks. Awkwardness steps in, the initial “action” tasks are done, and then we don’t know what to do. We don’t know what to say. When the initial activity is done, what do we do then? Do we step forward…or do we step away? Do we walk alongside the griever…or do we cross to the other side of the street (or down the next aisle in the grocery store), hoping we haven’t been seen, to avoid contact? Do we disappear or do we support? It’s not easy to step forward into grief. It’s awkward. It’s not very pretty. It’s fearful. But, I think that once that fear has been conquered and the effort made, the stepping forward on a continual basis becomes a bit easier and, as Ms. Callaway says, becomes rewarding. It takes a lot of guts and it takes a dedication of time, but it can be well worth the effort. We feel better about ourselves and that becomes self-perpetuating. The result is that the griever feels loved and supported. The opposite is true, too. When we avoid the griever and disappear, we feel guilty and bad about our behavior towards the bereaved. We know we’ve avoided them; they know we’ve avoided them. Then what do we do? We feel even more awkward and fearful, don’t know how to step forward, and that becomes self-perpetuating, too, on our part. As time goes by, it becomes even harder to break the cycle and step forward. The result is that the griever feels hurt, abandoned and alone. Perhaps if we put aside some of our “unrealistic, self-imposed expectations,” it would be easier to step forward. This becomes self-perpetuating on the part of the bereaved, too. I’ve written extensively about how many people disappeared and how little support we had following Jason’s death. For me, I had a hard time believing that the person who called me once every three or six months to “see how I was doing” (when I didn’t hear from him or her at all in between) actually cared. I felt like I was free-falling into a pitch-black pit and there was no one there to reach out and help stop my fall. I quit trusting in friendships very much and built walls around my heart to protect it from further hurt, and I would periodically peek out from behind those walls. I think I realized those walls were not healthy, and I tried reaching out. When I did try to reach out to people I knew, it was not always successful. I sometimes felt like I got my hand slapped. I felt rejected because of my grief…and the other person’s fear and awkwardness. I would then pull back behind my walls to protect myself and my heart. It’s a hard cycle to break once it’s set. There are other crucial times when we can choose to step forward. As I said above, I realized the walls I had put up to protect my heart were not healthy for me. When the bereaved reaches out at a later time, we once again have an opportunity to choose whether to step forward or step back. I had one friend who, months after Jason died, sent me an email to apologize for disappearing. I was so relieved that someone finally “got it” that it was hard to see people disappear from our lives. But, then I didn’t hear from her again for a long time, and that was really hard for me. I also got a letter from a gal about a year after Jason died, apologizing for avoiding me because she didn’t know what to say. I appreciated the apology, but I didn’t hear anything else from her. With so many people in the same boat – awkward and avoiding us – who was there to step forward? Another crucial time is down the road. You have walked with your friend for a while. You are getting tired of your friend being so sad all the time, are tired of hearing the same old stories over and over again as your friend tries to work through her grief, and feel like it’s time for her to move on…or maybe you feel like it’s time for you to move on. What do you do? I ran into a fellow bereaved parent ten years after Jason died. I felt like she had adequate support following the death of her child, both immediately and the continued years. I was surprised when she told me that, now that she was ready to “do things,” there was no one left. The people that had offered support initially grew weary and tired of waiting for her to “move on,” so they had moved on themselves. Her support base had moved on without her, and she didn’t have friends to do anything with. It’s hard to be there for the long haul. If some people feel like they need to move one, hopefully there will be others who step forward. Back to the book review…Each chapter is concise, giving helpful suggestions on what to do and what not to do in order to help the bereaved. Ms. Callaway dedicates chapters on helping a returning co-worker and how the medical community can be supportive. 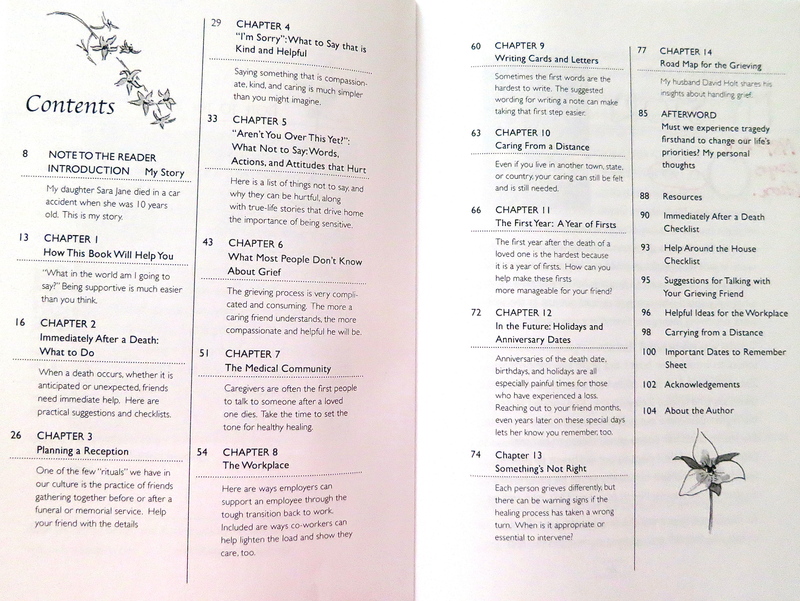 Some chapters, such as the one entitled “Immediately After The Death,” give a checklist of helpful suggestions, and the Resources section at the back of the book not only lists groups to contact, but also repeats these checklists. The chapter on “In the Future: Holidays and Anniversary Dates” is only two pages long, but encourages the reader to be the one who notices and remembers. Remember. Remember. Remember. Keep remembering. Tell your friend what you remember. Write down what your memories to give to your friend if you aren’t comfortable talking about them. Give your friend pictures of her child that she may not have. It makes a lot of difference. One gal sent me a card on the anniversary of Jason’s death. It meant so much to me, and I realized one year I was looking forward to getting her card. Unfortunately, that was the year she quit sending them. Ms. Callaway’s husband, musician David Holt, finishes the book by writing a chapter for the bereaved, entitled “A Roadmap for the Grieving.” He offers some helpful suggestions to the bereaved on what to expect and how to help oneself during this time. It also is concise, but offers some good things to remember. I would recommend this book to both the bereaved and friends. As I said at the beginning, it’s short, well-written and easily readable in one sitting. It encourages proactive behavior, giving the reader specific suggestions and reasons to step forward instead of away. I think the premise of the book can be summarized in the last paragraph in the chapter on “In the Future”: “Reaching out can feel infinitely difficult. But if you stop and think for one minute what a hard time your friend is having, it will seem easy for you to pick up a pen, make a call, or pay a visit.” (p. 73) It bears repeating: As difficult a time as you are having, it pales by comparison to what your friend is going through. Stepping forward can make all the difference in the world. If not you, then who??? Callaway, Ginny. A Friend in Grief: Simple Ways to Help. Fairview, NC: High Windy Press, 2011.